About - Pat Bernard Design Inc.
Pat Bernard continues to build on her years of design experience and a lifetime of playing in the dirt. Taking her experience in advertising and graphic design, in 2000 Pat finally submitted to her first true love – creating playful outdoor spaces: dog and kid friendly designs with a grown-up sense of style. “Give a Hoot, Don’t Pollute” was one of the first English sayings Pat learned after moving to Chicago from France at the age of 12. Her seventh-grade social studies teacher taught that the earth was ours to safeguard, and since then Pat’s approach to her work has always been to reduce, reuse and recycle. From kitchen gardens to green roofs to full landscape renovations, Pat uses plants and structures to create unique spaces customized to the individual needs of her clients. Pat’s involvement in every project is profound. 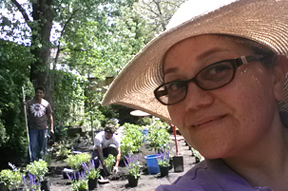 She not only designs all the gardens, oversees the installation, and sometimes chisels stone to make it fit just right, but she supervises the maintenance and will often spend time hand weeding or pruning in her client’s gardens. Pat Bernard Design is a member of the following associations. Our difference is in the details. Providing solutions that take a thoughtful approach to urban issues. We use low maintenance landscape solutions, permeable pavers and regionally sourced stone to create gardens that flow with the architecture of your home, your lifestyle and your budget. We consider the micro-climate, soil needs, and exposure of each site to ensure that the right plants are chosen for each project. 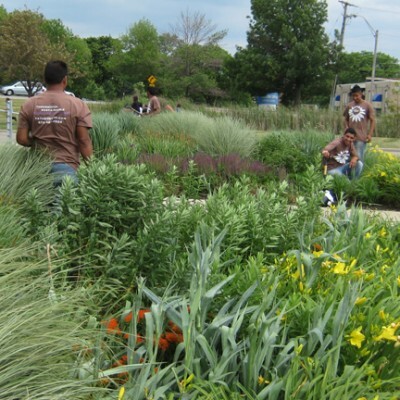 Native plants and ecologically sound protocols are used as often as possible. Each detail is considered to ensure results that bring long-lasting enjoyment using the smallest carbon footprint as possible. A thoughtful approach to design allows us to make decisions based on a full assessment of the property, the client’s needs and wants, the budget, and the impact our design will have on the surrounding community and environment. We start with a consultation in order to ask and answer questions, share ideas and discuss issues that need to be addressed. This is a great opportunity to share photos of your ideal outdoor space. Prior to this consultation, we email a questionnaire to help you focus on priorities and to give all family members an opportunity to write down their ideas. Everything is hand picked from the plants to the pavers to the mulch and all other components. We place orders for material only once we have received an approval of the design. This allows us to select the freshest plant material, usually delivered within a few days, and select natural stone for its nuances of color, texture, and proper size to reduce waste. 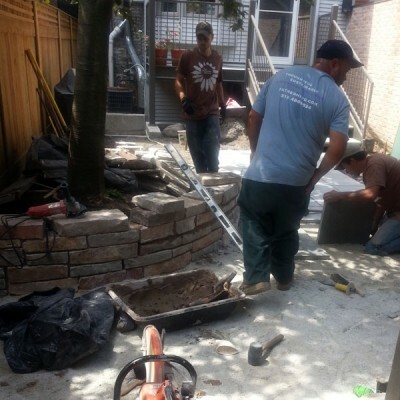 We work on one job at a time, so your project will be completed quickly and efficiently. Without a proper maintenance schedule even the most robust plants will not show at their optimum. A garden is not static; it changes through the seasons and over the years. Our maintenance program can be done weekly or monthly and includes pest, disease control, weeding, cultivating, and pruning. We prune trees and shrubs only at the appropriate time for the specific plants, and fertilize only when and where necessary using organic fertilizers. Our maintenance program includes a Full Garden Clean Up, starting in March, and our Fall Tidy-Up, which includes deadheading and cutting back of appropriate plants in late October. We do not offer lawn maintenance but can recommend a service.